The Federal Reserve may extend into next year a facility that gives investment banks access to emergency cash if the financial turmoil persists. The lending facility was put in place in March to stabilise the financial system as Bear Stearns collapsed. 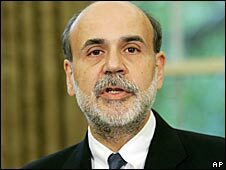 Fed chairman Ben Bernanke also called on Congress to give the central bank more authority to supervise markets. The Fed will issue new rules next week aimed at cracking down on dubious lending practices. Analysts said Mr Bernanke's suggestion that emergency lending facilities be extended was a sign that policymakers expect the financial strain to continue for some time. It would also help financial institutions if, as markets expect, the Fed was to raise interest rates later this year to tackle inflation. Mr Bernanke said the Fed was considering extending its lending facility, which allow investment banks like Lehman Brothers, to access cash for six-months, beyond the end of the year. Previously, access to emergency funding was only allowed for commercial banks such as JP Morgan. The Fed's decision to act as a lender of last resort for Wall Street firms came as it rescued Bear Stearns from bankruptcy. "Allowing Bear Stearns to fail so abruptly at a time when the financial markets were already under considerable pressure would likely have had extremely adverse implications for the financial system and the broader economy," Mr Bernanke said. The Fed is also expected to issue new rules aimed at preventing a repeat of the crisis in the sub-prime mortgage market, which lends to those on low income or those with patchy credit histories. The rules would restrict lenders from penalising risky borrowers who pay off loans early and prevent lenders from making loans without proof of a borrower's income among other measures.